"It's so damn exciting that I finally get my chance"
Peduto celebrates with his supporters at his Election Night victory party, held at the Pittsburgh Federation of Teachers headquarters on the South Side. 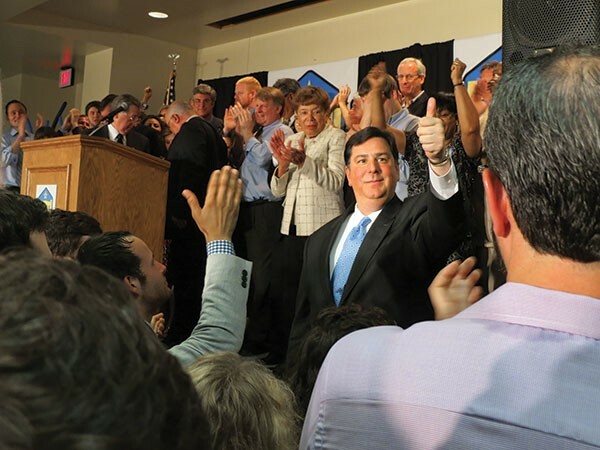 Bill Peduto sat down with City Paper two days after becoming the Democratic nominee to be the city's next mayor — a goal he has pursued for the better part of a decade. An extended version of this interview can be found here. So congratulations on being the Democratic nominee. Have you gotten to meet Tiger Woods yet? Nope. I've never met anyone named Tiger. What have the past couple days been like? More reflective than euphoric. It's sort of like if your deck's falling apart and you think, "One day I'm going to fix the deck." You spend years obsessing over how you're going to fix the deck: You hire the best people, they write the plans, and one weekend it's sunny out and you fix the deck. You don't then go, "WE FIXED THE DECK!!" ... There were two moments [on Election Day] where there were tears in my eyes, but they were both with family. The only time in the campaign when I thought we could lose was those few hours before the polls closed. Really? There were times when some of your supporters were antsy. About six weeks out, we were anywhere from 7 to 10 points down, and [Jack] Wagner had gone up on the air first. Over the next five weeks, he outspent us 2-to-1. ... And on top of that, [Mayor Luke] Ravenstahl starts his crazy ads, and they run over $300,000 worth. But we had built a field campaign that would crush Ravenstahl. We were never going to have as much money as Luke, so we were going to have to win it in the field. I always felt that even if [Wagner] stayed ahead 5 percent, we were still going to win, because we were going to push out the vote. Wagner was complaining right up to the end about the negative ad you ran, saying he never cut Meals on Wheels, as you made it sound. Do you have any regrets about the spot? We'd been told by supporters of Ravenstahl that they were going to come out against us with negative ads that were going to be very harsh. So we had to go up on a comparative against Wagner. And the strongest comparative we had was "pay raise versus pay cut." [Wagner had voted himself a pay raise as a state senator; Peduto supported a plan to give up a small portion of his salary to help defray police layoffs.] And the other part, which dealt with [Wagner's position on] the Corbett budget, was factual. But you know what independent observers said: There's a difference between supporting certain budgetary principles [as state auditor general, Wagner had, agreeing with Republicans on some key assumptions] and supporting any given cut. But the debate was very real about what would be cut if the budget got approved. If he's arguing that he didn't cut Meals on Wheels, then the question is, "What did he think would be cut?" ... Jack had been attacking me at every debate: "The problem with this city is you've got this mayor and THIS council." ... He used his surrogates to say not what he was going to do, but why I was a bad person. And my surrogates were told, "Don't mention his name. Talk about what we're going to do for Pittsburgh." ... His attacks were personal, cloaked in very charged issues. When you put up the neighborhoods of Homewood and the Hill District [in ads], you aren't being subtle. You still sound pissed off. I get upset when I hear people commenting, "This has been a very negative campaign by both sides." We had a lot of arrows in the quiver, and we could have made it a personal attack as well. Every time he said [that] I don't talk to [fellow city councilors] Ricky Burgess or Darlene Harris, we could have reminded people that there was a coup against [Wagner] in city council, and they ousted him as president. You especially took a beating from the Fraternal Order of Police, with FOP head Mike LaPorte accusing you of lying about taking a pay cut, and for using actors dressed as police in your ads. I've never seen a public-employee union head take actions like that. ... There's a group within the bureau that controls certain operations, especially around off-duty details [providing security at bars and events]. They are so afraid that if I get in, the gravy train will end. And guess what? The gravy train is going to end. On the other hand, I can't think of a local race where I've seen $100,000 come from a single source, as you got from the Laborers union. Shouldn't we be worried about what they expect in return? They had been isolated by the Ravenstahl administration, and they were looking for the best person to win against him. ... The building trades — the other side that is also influenced by people like Mike Turzai, Republican powerbrokers — were not only sticking with Ravenstahl, but going to Wagner. They put in close to a quarter-million dollars. 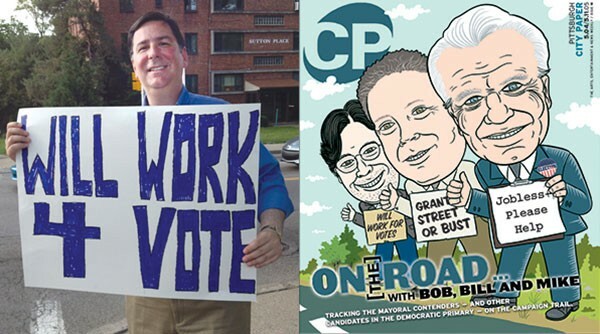 On Election Day, Peduto toted a sign inspired by a City Paper cover dating back to 2005 — the year of his first mayoral run. But from the perspective of a taxpayer who worries, "Now there's going to be a sweetheart contract for [Laborers working on the city payroll]" — why shouldn't that be a concern? Just because of the way I do business. I make it clear upfront that I don't negotiate the deal in order to get the endorsement. I haven't promised one person a job. Everyone says, "Guy Costa [the former city Public Works director who managed Peduto's campaign] is coming back!" Guy went back to work for the county today. That's a discussion that I will have with him at the appropriate time, but the appropriate time wasn't before Election Day. Still, when campaigns appeal to youthful idealism, people get disenchanted quickly when candidates don't live up to their hopes. How are you most likely to disappoint us? I guess it would be that, while I'm very committed to doing the national search for people, there may be enough talent inside this city — not necessarily inside city government, but inside the city — that there wouldn't be a lot of people coming from outside the state. I've thought about it in the past 48 hours: There are so many different people that I know, some of them couldn't get involved in the campaign because they worked in nonprofits, but they'd be really good people. I don't know if I can convince them to work for city government, but if I could, people would say, "See? He hired locally. He was just saying that." Or that you just hired your buddies. I think people are going to expect that I clean up government and don't operate in a way to help a few people get rich. They're going to expect me to get more involved in education, and deal with issues of poverty. They're going to expect me not to be divisive, but to rise above it when it occurs. They're going to expect me to invest in neighbohoods that haven't seen investment. I'm not going to change my opinion on fracking in the city, or the UPMC lawsuit. I've planted those flags already. And I hope that I can let people see me more than they have when I was on council. I think you know that I'm a pretty funny guy. Well, I'm not just a policy wonk that's stiff, and I come off that way to a lot of people. I've gotta learn to let the guard down more. I think that's what the city needs too. You'll be shifting from a legislative to an executive position — a role you've never held before. Does that worry you? I've been watching people play the video game for 19 years. It's so damn exciting that I finally get my chance that there's nothing fearful about it. It's more anticipation. Which raises the question: What video game do you think running a city will be most like? [Bally Midway's 1983 game] Tapper. You're a bartender and you have to run around as the customers come in and the beers are coming out. It's impossible to keep up. The people keep coming down, and they get angry if you don't give them their beer. And you have to get the empty glasses, too.